I’ve been wanting to write this post for quite some time but kept putting it off because, well, it’s just not a “pretty” thing to talk about. If you search Pinterest for tips for this situation you’ll find tons of articles and I have tried them all over the years. One solution in particular that has been pinned a lot didn’t do a thing for my boy’s bathroom-then I realized the author had only daughters! How could she possibly truly understand the full extent of little boy nastiness that can occur??? 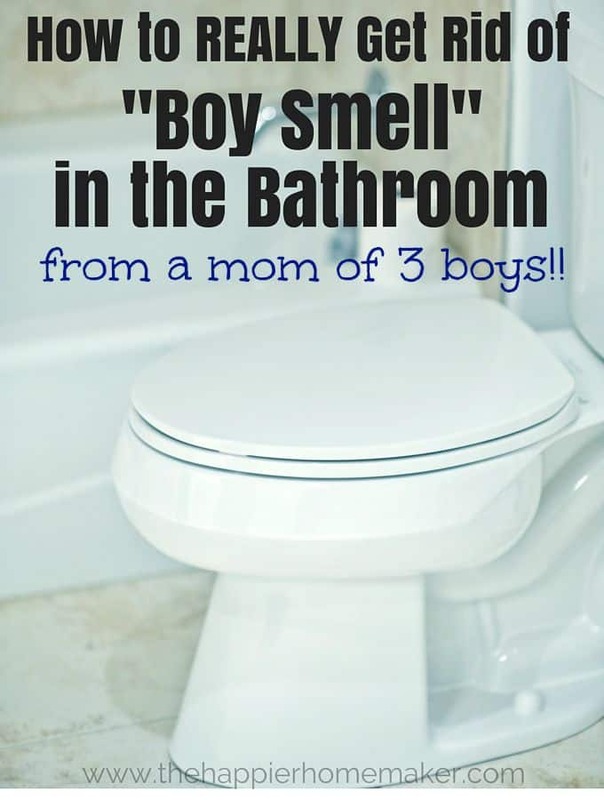 Today I’m here to tell you that as the mother of three young boys (all under 9) that this is how to really get rid of boy smell in the bathroom! First off, I didn’t take a ton of pictures for this post-I’m not filling my blog with toilet pictures, it’s icky. Second, this is not one of my natural cleaning posts. I’ve tried four hundred different combinations of baking soda and essential oils and they did NOTHING to get rid of the pee smell in my boy bathroom. I had to pull out the big guns to get the job done. It’s important to know if your grout is sealed-it will make a big difference in how much your bathroom retains the stinkiness and how difficult it will be to clean. I gave a full tutorial for how to refresh and seal grout when we were at our last house-you can find it here. If your grout is not sealed I highly recommend you seal it after a thorough cleaning to help make cleaning easier in the future. Now for the cleaning-I recommend bleach-I use this cleaning spray. Start at the top of the toilet and wipe it down with (thick) paper towels. Don’t just pay attention to the obviously soiled areas-believe me when I tell you that there is a fine layer of miscrospray over the entire area. I know. It’s gross. But it’s true and if you don’t get every inch of the porcelain you can’t expect for it to really be clean. As you make your way down the toilet be sure to wipe around the area where the toilet seat attaches to the bowl and then wipe down the sides of the toilet bowl exterior and all around the bolts at the bottom-this is a huge problem area for my little guys. I also use the bleach on the tile about a foot out from the toilet base as well. Finally I clean the bathroom floors with my steam mop because the high steam temperature really helps get the area clean and removes any bleach residue that might be left. Okay, there you have it-my essay on cleaning boy pee-pee bathrooms. I promise to be back to more appealing subjects tomorrow!! Anybody have anything to add? I’d love to hear your tips on what has or hasn’t worked for you! I am also the mother of three boys but mine are grown – 33 – 37 and 41. I had my husband empty our toilet of water and made an X at the back of the toilet. I told the boys to “aim” at the X. That worked for awhile and then it stopped. One day I exploded and I told them that if I had to clean the toilet like I usually did again – I would stop cleaning it. One of them asked if that wouldn’t be disgusting and I told him no because they were going to clean the toilet. I told them I didn’t care who did it but they would take turns cleaning the toilet. I never had a problem after that. I recently got Clorox wipes for my boys for the same reason Patty. They have to clean it twice a week but eventually the smell will build up without a deep cleaning. The problem at our house is distractablity-I’ve heard having them aim for a cheerio can help too! Now, how about helping with litter box for two old cats ??? Also a mom of 3 teenage boys, I have found you can’t stop at the floor. Most toilets are next to a shower tub or vanity. I once had a glass shower enclosure next to my boys toilet and wow…it really showed that little boy pee splatters afar. I sometimes think they have pee wars or pee in the dark of just plain have bad aim. But you have to spray down and wipe the surrounding walls. Also I remove my toilet seat every few months and clean all the pee out from under there. Many toilet seats have little flip covers that you can just pop it right off. While it’s off I stick it in the tub or shower and give it a really good wash down. Sometimes when nothing seems to work, it may be from an old, dry, cracked, wax ring that is causing a slow leak under the toilet. That means, removing the entire toilet from the floor and replacing the wax ring. good tip Gail, thank you! Ewwww, old wax rings can be quite nasty. Good advice tho. The wax ring is basically a gasket, sometimes toilets get pushed over a teeny bit by repeated use and/or by heavier people. Even a little mis-alignment can cause leakage, and you can’t thoroughly clean this stickywax due to its nature. Installing a new wax ring is a project but worth the hassle if your clean bathroom continues smelling like pee. There are several toilet seats available that can lift off for cleaning!!!! I can’t tell you how elated I was to learned of these. Only a mother o boys can appreciate such a thing, I just lift the caps and remove the seat, wipe with bleach and the thick paper towels, reattach the seats and boy bathroom heaven. Oh I need to find those when we move out of this rental Martha! Anything that would improve the situation!! This is a great site. My solution to make the toilet easier to clean was a more expensive one piece toilet which has the tank connected to the base.and only the seat is separate . Anyone might think this is an expensive item, except to me 20 years of not having to clean the space between the tank and the seat still makes me smile. My husband taught my son (when he was little) to sit on the toilette- though only at home. Never had the problems u guys are describing! I also use clorox to clean my boys bathroom. I also use it to kill the germs my oldest brings home from school. He uses paper towels for his hands instead of a hand towel. That way I don’t have to wash the hand towel all the time and instead of him using toilet paper he uses those flushable wipes. His bathroom seems to stay cleaner. Yes-I’ve definitely noticed that as well Suzanne! Thank you for the tips, I almost lost hope on that! I only have one boy at home and clean the half bathroom where he likes to pee everyday, but the smell is still disgusting! I will try clorox and teach him to sit instead. I spray the entire toilet with diluted detol and finish with a hand held steam cleaner. No scrubbing!! This gets in all the crevices and sanitizes. I also encourage sitting. On a side note… My best friend lives in Sweden and is an Urologist. She told me they have done studies that show males should pee in the sitting position at least once a day to totally empty there bladder. When they stand a little “old” urine always remains and can lead to cancer. For the gent stench, I find straggle hairs (your boys are too young yet – but even you’re own or pets’) exacerbate the problem. I keep a second brush attachment for my vacuum and use that before the deep clean and by itself between -prevents a vehicle for gunk to stick to. Thanks for the gel pen tip – it’s working a treat! As for the speedy clean, be sure your entrance (the first place they see) is clean; the few minutes spent on a window/doorknob wipe and shaking out the welcome mat go a long way to setting the tone of the first impression. Cap it with a clean and FRESH-smelling bathroom (a later boost to the impression should it be waning…).Thanks to all y’all for sharing. To the Dad whom remembers the ‘if you sprinkle when you tinkle, be a sweetie and wipe the seatie’ I say ‘good on yer’ and make in my house wipes available discretely that can be used for both body (no harsh chemicals) and bath fixtures (no lotion) and are flushable. Oops! That’s Dad who, and discreetly- my bad. As a middle aged man raised in Europe I have to tell you I can’t believe American men still stand over their toilet seat to pee. It was proven that urine splashes up to six feet away from the bowl when used that way. It is disgusting. Teach your husband and boys to bloody sit down. It is a toilet SEAT, not an urinal. I put white towels on the floor. I spray the entire bathroom down with bleach and scrub. Next I rinse with hot soapy water and put the towels in a trash bag and I am done. I also put towels inside the shower, so that I don’t slip while cleaning inside there. I was a better parent than most then, because a good mother teaches her boys to sit down on a toilet and stand ONLY at a urinal. As per their design. That is how keep from it being there to have to clean it the first place. Anyone who questions those designs, well, have your son or hubby pee with nothing but a blacklight on. It literally goes everywhere!! Even coats toothbrushes! Standing at a toilet to pee is barbaric and super gross.When a male pee’s standing at a toilet, it is far more that the toilet getting coated with urine. Mothers, teach your boys right. Yuk!!! The black light is the best way to find urine splash; walls, flooring, and of course, on every toilet surface. Bleach is great, but I accidentally discovered something even easier. Lysol Spray. Used with paper towels and a toothbrush if needed, you’re good to go.